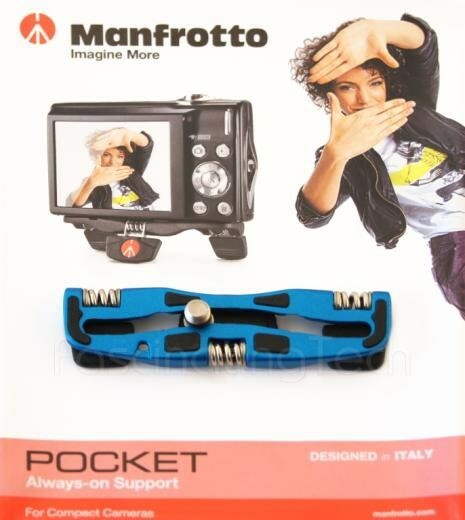 The Manfrotto Pocket Support provides a secure and sturdy footing for any compatible compact camera. 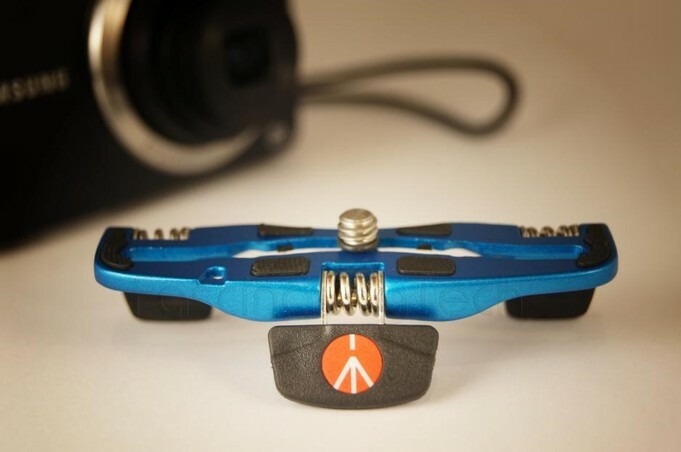 Its adjustable sturdy feet allows the attached camera to be placed on most uneven surfaces while its height should allow it to straddle wet areas too. 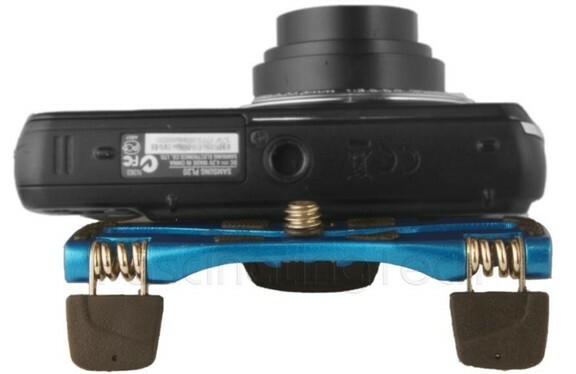 Its light weight allows it to remain connected to the camera without adding any significant weight and without interfering with its operation. If you are concerned that resting your camera on a surface will scratch the bodywork, or that the battery compartment will get wet when placed on a damp surface, the pocket support can provide some protection against that too. A useful stocking filler for the occasional photographer. The unit reviewed was a rich metallic blue colour with 6 black rubber inserts along the top face (which rest against the cameras body) and three rubberised feet attached to three strong springs. The feet have a beauty ridge cut into the front of them (for looks) with the front foot emblazoned with the Manfrotto logo. The rear of the rubber feet have a couple of grooves moulded into them which should provide some additional grip if perched on uneven ground. The only part protruding above the top surface of the unit is the ¼" screw that connects it to the camera. The screw is free to slide along a channel that is cut into the top of the unit but is retained by a washer to keep it from falling out. It's a neat looking device. 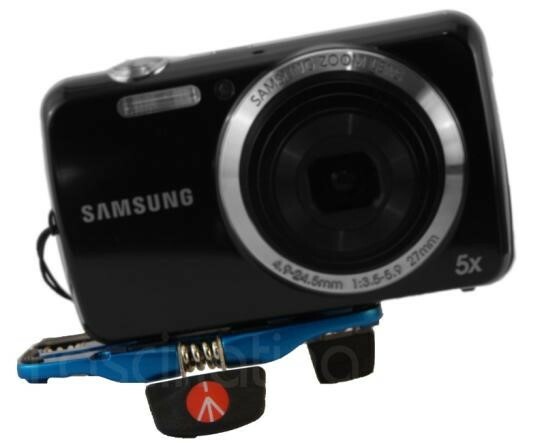 The blue colour fits well with the black camera I used for the review and when attached does not seem out of place. I does not add much weight to the camera itself and is not really noticed when the camera is held in your hand. Being such a thin and lightweight unit, the rubber inserts are themselves quite small and thin. After connecting and disconnecting the unit from my camera multiple times, one of the rubber feet came unglued and fell off, while all 6 showed some evidence of being squashed and compressed. The insert that fell off was pushed into place again and has held up well since, while the evidence of compression has worn away somewhat showing that the rubber is quite resilient. The blue paint is quite thin and the underside of the unit shows a few tiny areas flaking off or missing (visible on some of the photographs I took) but the top surface looks pristine. So long as the unit is not being continually connected and disconnected, and generally looked after, it should not cause you any problems. This is a straight forward affair- With the Manfrotto log pointing in the same direction as the camera lens, place the top of the unit against the bottom of the camera so that the ¼" screw aligns with the corresponding hole in the bottom of the camera. A couple of light twists of the screw with a wide blade, thin screw driver (or a 1p coin) will attach the two components. Do not over tighten the screw else it may damage the screw thread, the rubber inserts or the screw hole. The image below shows the support reversed. The logo should be to the front when connecting it. With all three feet extended at an appropriate angle, the support provides a sturdy base for your camera. Stability will ultimately depend on the size of camera, the lens extension and the surface it is placed on, but on a concrete wall, a stony road, a bench or table top, the unit stays pretty steady. With my particular camera (Samsung PL20) and with lens fully extended, the device and camera remained upright when on a tabletop and being subjected to pushes, knocks and heavy books being dropped next to it. The three feet can be adjusted to accommodate uneven surfaces, inclinations, or just tilted back to angle the camera up a bit. If you are in a bar or restaurant and want a group shot, this device will suit; Fold the back feet back a bit and the front one upright a little more and the camera will point upwards at an angle rather than straight forward. Finally, the unit can be moved left or right, or even rotated, while still attached to the camera allowing for creative positioning \ framing or to accommodate other uneven surfaces. Note, that this may unbalance the camera so caution is advised. When not being used, the support can be kept attached to the camera with the feet folded in. It only adds a 0.6 cm to the overall height of the camera and the weight is negligible. The screw can be loosened slightly to allow the unit to slide left or right if you need to gain access to a battery compartment or memory card slot. A couple more turns of the screw will release the unit completely when needed. This review is intended to highlight the pros and cons of the item under review, not provide details on how to use it. Where notes on use are provided, these are the reviewers observations at the time of review and may not necessarily represent the best, easiest, recommended or proper use of it. If you wish to use any of my review images or videos on another site or in another publication, please contact myself and \ or the editor of Fascinating Tech and wait for permission first. • they are not used in illegal (UK or readers locale - whichever is less lenient) or questionable publications - I have sole discretion in deciding what is "questionable".